Roses are red, violets are blue, we made a list, of special gift ideas for you. With the 14th of February marching ever closer, it's probably time to start looking for that perfect Valentine's Day gift for that special engineer in your life. So let's cut to the chase and get this list started, here is our hand-picked selection of great gift ideas for Valentine's Day. Look, at the end of the day, who doesn't like aviator glasses? Just because you are an engineer doesn't mean you can't look freaking awesome at work. Your Valentine will look great and stay safe at the same time with this amazing gift. Let's face it, engineers don't have the healthiest of diets! Why not help your loved one out and make them impress their colleagues with this awesome 3-D pancake printer. This quality device lets your valentine turn any image they want into delicious edible art. You could always buy this amazing device for your home and perhaps prepare a romantic Valentine's Day breakfast for your loved one. Blending romance with the future, this ring is the perfect gift for that special someone. Your valentine will never miss an important call or message again because, with this smart ring, they can set custom alerts using subtle vibration and light patterns. Love them or hate them Apple MacBooks are certainly good looking. This Valentine's Day gift is certainly a bit of fun and pretty useful. If you are looking for something a little different for your other half, this cool pocket mirror is worth considering. It's compact, small and ultra-realistic. Just perfect for that special lady engineer in your life. Well, well... chocolate and gears in one? Shut up and take my money! On the off chance, you're looking for a fun gift for your engineer valentine, these handmade chocolate gears will certainly win you brownie points. Surely these will be highly appreciated by anyone who receives them. Now, this is a great gift idea for your valentine. This living bonsai tree floats before your eyes, not with ancient Japenese magic but obviously with magnets. What a great gift for their home or office. Why not put flowers instead of the tree to make it a truly awesome Valentine's Day gift. Married to, dating or interested in a massive Star Wars fan? Get your valentine this incredible 3-D game. This gift lets your loved one navigate their X-Wing through the treacherous tunnels of the Death Star to victory. This is an amazing and fun game. They'll need to think fast, twist turn and maneuver with grace to save the galaxy! Are chocolate gears not enough? 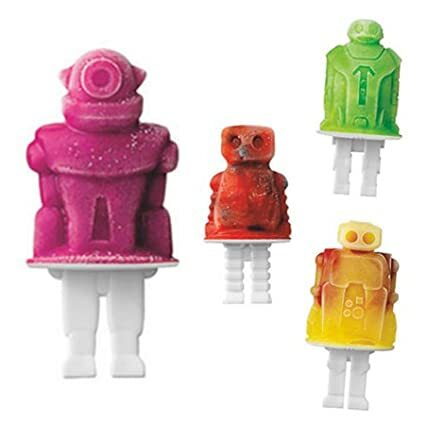 Try these silicon molds to make delicious treats in robot forms. The handles and sleeves come in four unique designs. These cheeky little monkeys are BPA-free and dishwasher safe. What's not to like? Why stop with just lollipop molds? Get your loved one some ice cube trays too. This cheeky item lets your loved one make four detailed retro-design ice robots and keys. The trays are silicone and look awesome. Add some "cool" to their cold drinks and they'll love you forever. Never buy a calendar again with this stylish and very practical Valentine's Day gift. This calendar that tells the month and day no matter what year it is, will look absolutely awesome in their office. Its post-modern design by Gideon Dagan, was designed for the Museum of Modern Art in New York in 1998. For the calendar's 10th anniversary these small editions were created for sale. Is your better half tired of their old-fashioned shoe laces? Why not inject new life into her old trainers with these awesome LED shoelaces. You can choose from seven different colors and wear them anywhere. These beauties are weatherproofed after all. They even glow for 55 hours on one battery. To be fair, these would be great for that special man in your life too. Any self-respecting engineer would cut off their right arm for this bad boy. They may not be able to spell but mathematics is a walk in the park for them. Let your valentine own their constant reliance on spellcheck whilst enjoying their favourite hot drink. Our last suggestion for a Valentine's Day gift is this absolutely stunning piece. This is simply the coolest way to ignite anything. With the press of a button, this lighter creates a dual electric arc that, frankly, will impress anyone. The device is flameless, rechargeable, windproof and just frigging awesome. I wonder if you can carry this on a plane? Probably not. So there you go, our selection of some great gifts for your consideration. Do any of them stand out for you? Which one would you choose for yourself? Would you add any other cool gift ideas to the list? Let us know.